Batavia was a ship of the Dutch East India Company, shipwrecked on her maiden voyage (according to Wikipedia). OR a city in Illinois, another city in New York, another in Ohio. Hmm. Somehow I would have thought that Batavian endive originated in Eastern Europe. At least there is the “Bavaria” connection. I’ve grown Batavian endive for several years. It’s reliable. It goes through winter (under plastic covers) perfectly, and by March is still very edible. 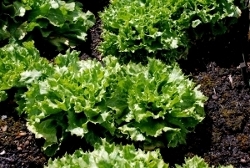 The slugs would rather feast on a more tender lettuce; they attack the escarole only as a last resort. 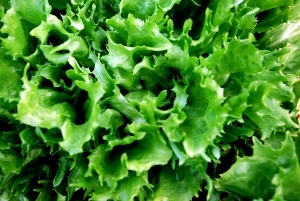 The inner leaves are tender enough for salad. As the leaves grow and move to the outer edges of the head, they get tougher and need to be cooked. 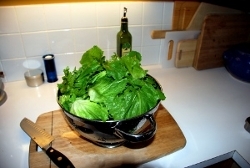 Here’s a great recipe for Kale and Escarole soup. I made this for dinner last night. Alas, I never have all the ingredients, so no pancetta, subbed vegetable broth for the chicken broth, and used Italian spiced canned tomatoes for the garden tomatoes. It was fantastic! I even had a can of cannellini beans. Served with garlic bread and a salad, great! In a large soup pot over low heat, add 3 tablespoons olive oil and sauté the pancetta, onion, garlic, celery and carrot until tender and fragrant, 15-20 minutes. Add the kale and escarole. Cook until greens are wilted and tender, about 10 minutes. Stir in the tomatoes and cook another 10 minutes. Pour in the broth and bring the soup to a boil. 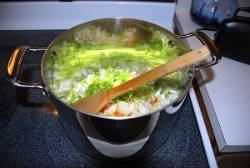 Once boiling, cover the pot, reduce heat and simmer for 30 minutes. Add the beans and cook uncovered for 20 minutes. Just before serving, add the lemon juice, stirring to combine, and salt and pepper to taste. Something went haywire with the internet this afternoon. I could get email, and to some sites, but not all. It seems to be working again. See my reply to your previous post. Hi Jeanette. Thanks for visiting my site. As to compost, I have two piles. One is for general garden waste: leaves, weeds (not anything that travels by vicious roots, like bindweed), grass clippings, deadheaded flowers, vegetable garden waste. This pile is simply, well, piled up. I know that I am supposed to turn it, but I don’t really have the energy or muscles to heave that mountain of stuff around. So I just let it sit. I don’t add manure (a nitrogen source) or water it, except once or twice in summer when there is no rain. In 2 years, it becomes great compost all by itself! After a year, however, I start a new pile, so that the old one can finish. My other compost pile is really two plastic bins. These bins are for kitchen waste (no animal products or fat). One bin is active, and the other is done and waiting to be used. When the active bin fills up, it gets to finish, and I move to filling the other bin. The food compost bins are filled with red worms. You can get these types of worms at a garden store; they are different than the usual out-in-the-garden worms. They make quick work of kitchen scraps. My way is the lazy way to make compost. Also, my compost does not get hot enough to kill weed seeds. Most home compost piles apparently don’t have the mass to really heat up. This results in lots of weeds in my garden, but I just pull them. If you add steer manure and water you might get the stuff to finish faster. Especially if you just have oak leaves to compost. There are lots of recipes for getting the nitrogen and carbon ratios just right, but we have enough variety of green and dry to hopefully even things out. Just don’t add too much steer manure, apparently it contains a high concentration of salts. I’d have to look that up. I think you can also purchase compost starter bacteria. I’ve never tried it. With all the rain we get here in winter, stuff just rots and melts anyway. Can’t wait to see the photos Doug took.